On August 27th, 1867 “five of the spiritual daughters of the Venerable Mother d’Youville reached Fort Providence”. 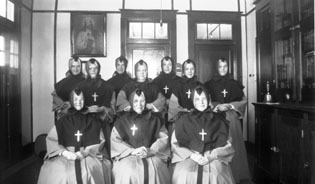 These Sisters of Charity, often referred to as Grey Nuns, had dedicated their lives to the religious instruction and education of the Dene of the Mackenzie valley. They established the Sacred Heart School and Hospital at Providence Mission (map), a Roman Catholic mission built, in 1861, on the north shore of the Mackenzie River eighty-five kilometers downstream from Great Slave Lake. This mission, founded by Bishop Grandin, was built with the intent that a Convent would eventually join them. The Brothers realized that “without Nuns we shall not be able to do any permanent good in these Missions”. Monsignor Taché named the mission La Providence because he believed it “destined to be the Providence of our northern Missions . . . the Hudson’s Bay Company, usually first in the field, was content to follow the missionaries and their Indians, and to accept the name already given.” The name later became Fort Providence. Eleven students attended the first classes at the Sacred Heart School on October 7th, 1867. Two years later there were thirty-five children, twenty-seven of them orphans of epidemics that periodically ravaged the Mackenzie valley. The Sisters admitted children from as far south as Fort McMurray (Alberta) and as far north as the Mackenzie Delta. The Sacred Heart School operated for ninety-three years and during that time the Grey Nuns also established, administered and taught at residential schools at Fort Resolution (est. 1902), Fort Smith (est. 1915), Fort Simpson (est. 1918) and Aklavik (est. 1926).